Testing spa water is simple with either a water test kit for chlorine based spas or test strips for chlorine or bromine based spas. A water test kit is preferred by some as it is said to be more accurate, but the test strips to an equally fine job of alerting the spa owner to a chemical imbalance in the hot tub. A water test kit comes with a dual chamber plastic vile with level readouts. On one side, a test for chlorine is done by adding 5 drops of OTO to the water sample. On the other side, the test for water pH is done by adding 5 drops of phenol red to a sample of hot tub water filled to the fill line. The caps are put on and the viles are shaken up to get the correct readout. Then adjust the water’s sanitizer and pH levels. Water test strips usually come in viles of 50 strips per container and they come in all sorts of different configurations. A popular test strip is the one that has 4 tests – chlorine, bromine, pH and alkalinity. Of course it won’t test for both chlorine and bromine because you should be using either bromine or chlorine as the sanitizer, never mixing the two. But this allows hot tub owners of both bromine and chlorine based spas to purchase the same test strip without worrying about it in case they eventually want to switch sanitizer after a water change, or to just not worry about being sure they purchased the correct test strip. The pH levels on the test strip will indicate over/under and allow for adjustment to within the 7.2-7.6 range. Some suggest it is ok to go as far as 7.8 pH and still be ok.
Keep test strips in a dry place to be sure they do not get moist which can affect readings from the test strip. Follow directions on the container they come in and take the reading right away after dipping the test strip in the water as the colors can change over time after the test is taken. 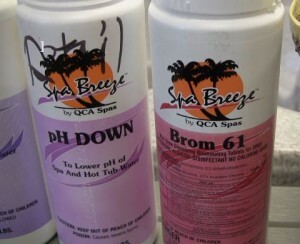 See the Monday-Wednesday-Friday Program featuring Spa Breeze Chemicals at Hot Tub Outpost USA and save on hot tub water test strips. Water test kits are also available online from the Hot Tub Outpost.